If you think it’s strange to don a set of hospital scrubs just to go sit in a room alone, then you don’t know Donnie. Though he does wear them while putting in hours for his hospital internship, other days, Diagnostic Imaging student Donnie Duncan wears them to sit in a room allotted to him at the Oregon Coast Community College North County Center in Lincoln City. It is in that room that he tackles the virtual part of the program. Donnie Duncan heads out into a rainy afternoon — and a bright future. Though, generally, online courses can be taken from home, there are a lot of benefits to taking them at the college, so OCCC staff found a space where Duncan has everything he needs to participate in the program, headquartered at Linn-Benton Community College. In other words, new millennium versions of “The dog ate my homework,” like “my computer crashed” or “the dog ate my power cord,” won’t wash if you are working from home. It also helps that the College is one of relatively few institutions in Lincoln County that is connected to the Internet via fiber optic cable, yielding reliable upload and download speeds of around 100 megabits per second – more than enough speed to make videoconferencing reliable and clear. Providing a room is just one part of the college’s policy of appropriate growth, which includes taking advantage of available partnerships. “It’s really important to us that we are not limiting what we have available for our local students just because we are a small school,” said OCCC Academic Advisor Colleen Doherty. Because the program requires serving his internship at the Linn-Benton Diagnostic Imaging department, Duncan still has a significant amount of driving to do, but he says that’s just par for the course. Every summer there is an opportunity for two people to enter the 24-month Diagnostic Imaging program through Oregon Coast Community College. “Just like the nursing program, the DI program is very intensive because of the number of prerequisites that are required,” Doherty said. “But students can get all their prerequisites here, which is another selling point.” And the job availability in Oregon, similar to nursing, is also quite high. Another part of Duncan’s willingness to buckle down comes from the fact that he is not an, ahem, young student. 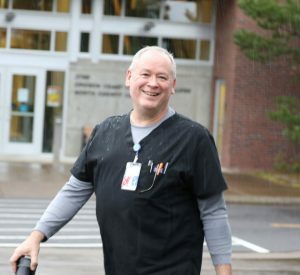 Doherty agrees that, while OCCC students of all ages can apply for the program, Duncan’s maturity has been valuable in the program. Originally from Appalachia, Duncan lived in Nevada for a while and worked in the electrical field. When his wife was offered a job in Oregon, he was ready for the move – in part because it reminded him of Appalachia. He has never regretted the move, and now has certainty about his choices of location and vocation. The final phase of the program is called an “externship,” which even distance students complete at a local hospital. Though Duncan is currently the only OCCC student in the program, Doherty is optimistic that the program will grow. To find out more about the Linn-Benton Diagnostic Imaging Program, including the scope of the pre-requisite work required prior to admission, and how you can participate as a student here at Oregon Coast Community College in Newport or Lincoln City, call Vickie Jones-Briggs at 541-867-8548 to schedule an appointment with Linda Mollino, Director of Career and Technical Education (CTE) Programs & Health and Human Services Careers. Or, schedule a free advising appointment with Colleen Doherty by clicking here. Oregon Coast Community College has served the communities of Lincoln County for 31 years. The College has locations in Waldport, Newport and Lincoln City and offers a growing selection of degrees and certificates, including a new Early Childhood Education certificate program and a new teaching degree program, built in partnership with Western Oregon University and the Lincoln County School District. Learn more by calling 541-867-8501.